Doing pre-season maintenance on your Riding Lawn Mower? Have you worn the tread off of those tires already? Are they dry rotted or damaged? Need an inner tube or a tubeless patch? Following my tutorial, you will be able to change a tire on a Riding Lawn Mower. 1. Leave the rim on the axle if possible. This should provide all the leverage necessary to complete this job in a respectable amount of time. 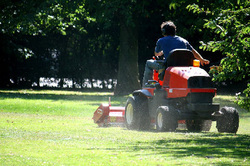 Start by setting the parking brake and chocking the remaining tires, to prevent the Mower from rolling. 2. Place a floor jack under an axle, frame rail or differential. Raise the tire off of the ground. Set an adjustable jack stand under the frame and lower the mower onto it, as a safety precaution. 3. Unscrew the valve stem core to release the air from the tire, and replace afterward. If you intend on replacing a neoprene valve stem of a tubeless tire, you can cut the stem in half to expedite deflation. 4. Break both the inside and outside beads, using a Tire Spoon or a Tire Iron. If you can avoid hitting the rim, use a 'Bead break Hammer.' If the tire has an inner tube, remove it now. With the inside bead in the center of the rim, work the outside bead over and around the outside. Work the inside bead over and around the rim, to remove the tire. 5. Use mounting lube or tire lube to wet both beads of the new tire. Set the inside bead of the tire onto the rim at an angle, forcing as much of the rim inside of the tire as possible. Now, using the spoon or iron, carefully work the bead over and around the rim. If you are going to use an inner tube, insert it now. *see Tips. Carefully, work the outer bead over the rim. 6. Force the beads outward, once you have a new tubeless tire mounted. You may find it necessary to use a pneumatic bead expander around the center of the tread. A ratchet strap will often work just as well. Be sure to release it as soon as the beads set. Attach an air chuck to the valve stem to fill the tire to the correct psi. * Sprinkle talcum powder inside of the tire to lightly coat the surface, If you are using an inner tube. Once the tire is mounted, inflate then deflate and inflate again to assure that the tube is properly positioned and wrinkle-free. * Tire pressure indicated on the sidewall, typically is 10psi (rear) and 14psi (front). Do not exceed the specified PSI. ​* Uneven pressure, side to side, contributes to an uneven cut. * When raising the rear-end, the mower could tilt side to side on the front axle. * If you spray flammable liquid inside of a tubeless tire and ignite it to seal the beads, be sure to have a fire extinguisher handy. Wear eye and ear protection when using this potentially dangerous method. Perform this method at your own risk! You can find many video examples of this process on YouTube.